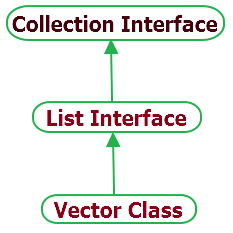 Vector class in java implements List interface of collection framework. If you don't know size of array then you can use vector class as size of vector can grow and shrink as per adding and removing items. As vector class is synchronized, It will give poor performance on add, delete, update and search operations. Elements of vector can be accessed using it's integer index. void addElement(Object element) : It will add specified element at end of vector. int capacity() : It will return the current capacity of vector. int size() : This method will return current size of vector. void setSize(int size) : It will set size of vector using given size value. boolean contains(Object element) : It will return true if specified element present in vector. Else it will return false. boolean containsAll(Collection c) : It will return true if vector contains all values of given collection c.
Object elementAt(int index) : It will return element which is located at specified index of vector. Object firstElement() : It will return first element of vector. Object lastElement() : It will return last element of vector. Object get(int index) : It will return element located at the specified index of vector. boolean isEmpty() : It will return true if vector is empty. boolean removeElement(Object element) : It will remove given element from vector. boolean removeAll(Collection c) : It will remove all elements of collection c from vector. void setElementAt(Object element, int index) : It will set specified element at given index of vector. Bellow given sample program will show you how to use vector class and it's different methods. //Initial vector capacity is 2. Increment it by 2 when required. //Get first element of vector. //Get last element of vector. //Add new element in vector. //Print all elements of vector using Enumeration. //Check if vector is empty. Above example shows you usage of mostly used methods of vector class.